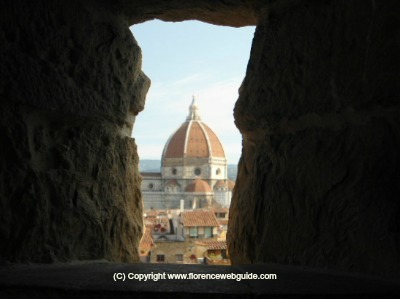 Take a Virtual Trip within Italy's Most Beautiful City with this Gallery of Photos of Firenze! 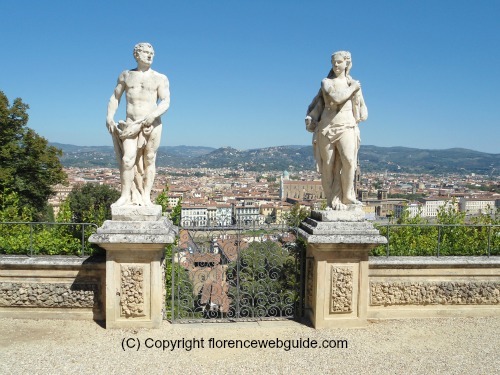 Want to see pictures of Florence landmarks, monuments, squares and artwork? Shots and glimpses of the 'hub of the Renaissance' that are different from the standard run-of-the-mill stuff? 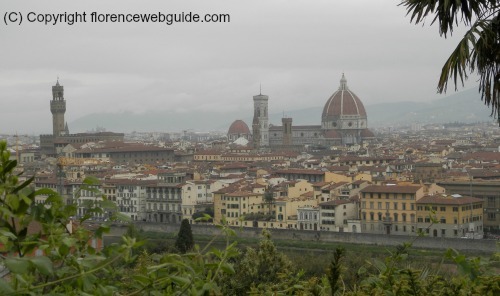 This FlorenceWebGuide gallery of images is just that! Whether you want to get to know Florence a little before your actual visit, or just to re-live memories of a past trip, these shots will not disappoint. Just click on one of the pictures of Florence to get the gallery going or simply scroll down the page...and enjoy! 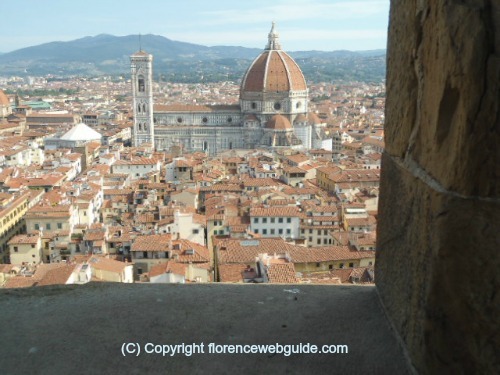 The shot below shows the Florence cathedral from the Arnolfo tower of Palazzo Vecchio. 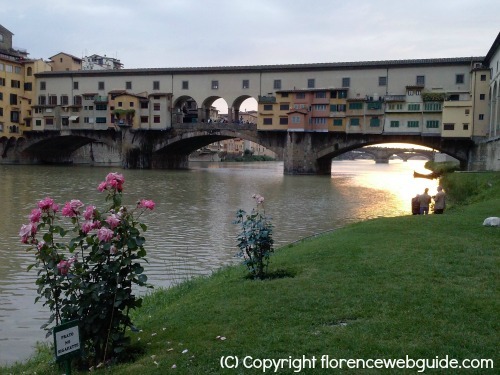 The pic below shows the Ponte Vecchio from the Arno river at sunset in summer. 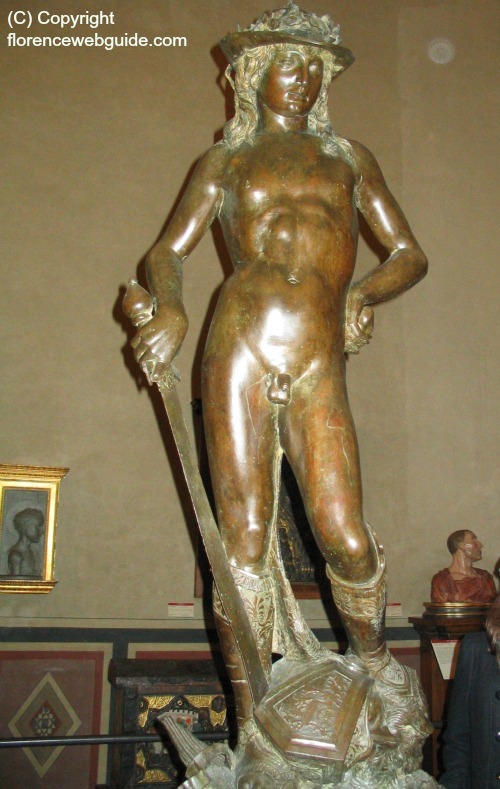 The next pictures are a front and back view of the Statue of David by Donatello. 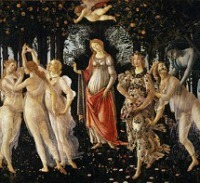 This renaissance masterpiece can be seen at Florence's Bargello Museum. 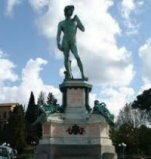 Want to find out about all the famous David's and why this bibical figure is so important a symbol for Firenze? 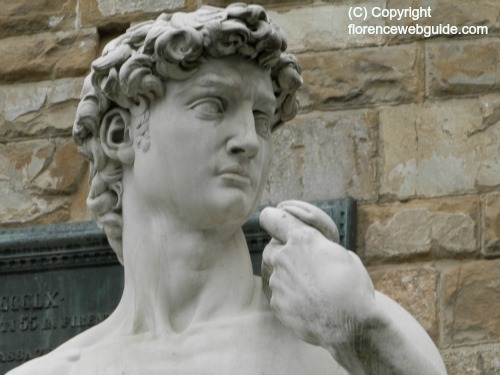 Read about the Statue of David, Michelangelo's, Donatello's and others. 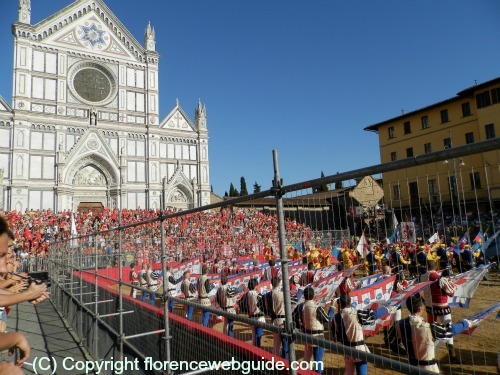 The next pics show one of the famous Florence churches, Santa Croce during a match of Calcio Storico, a historical tradition carried on for over 500 years. 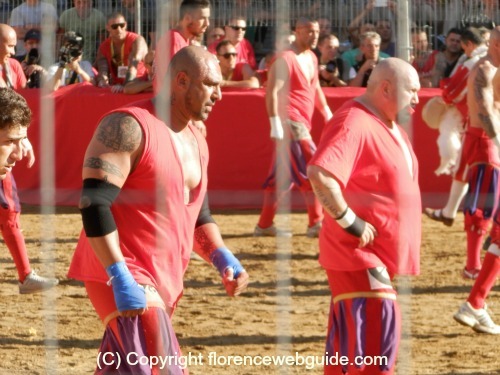 This form of renaissance soccer/football is also a mix of rugby, wrestling, boxing and even martial arts all rolled into one with players wearing period costumes. Michelangelo's Statue of David (a replica) is seen in the background. This is the spot in Piazza Signoria in front of Palazzo Vecchio where the original sculpture was first placed in 1504. 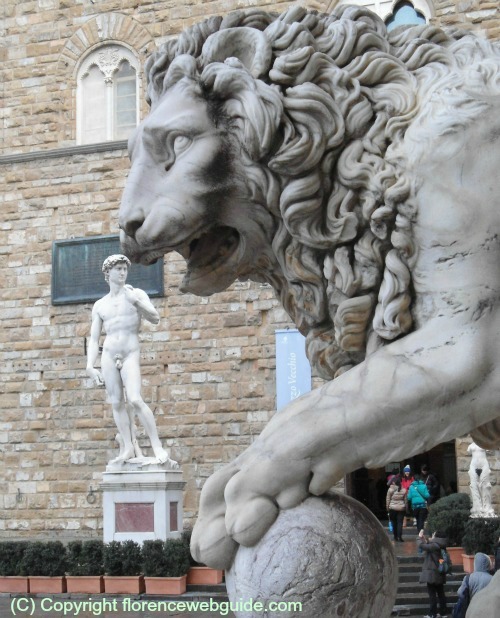 In the foreground you can see another iconic symbol of Florence, the lion. See the ball under our feline friend's paw? Balls represent the Medici family, who pretty much ran the city for about 300 years. 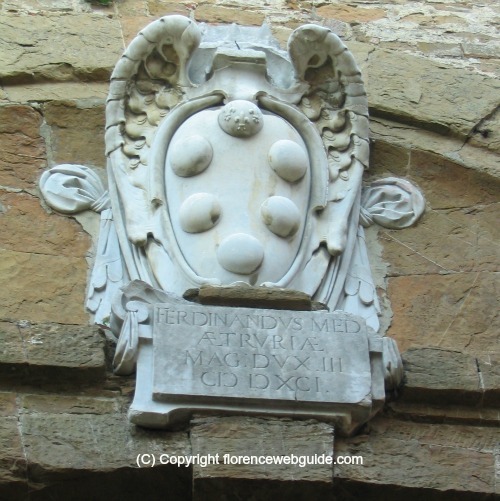 The Medici coat-of-arms is decorated with balls (see pic underneath), although nobody has figured out with certainty what these balls actually represent. 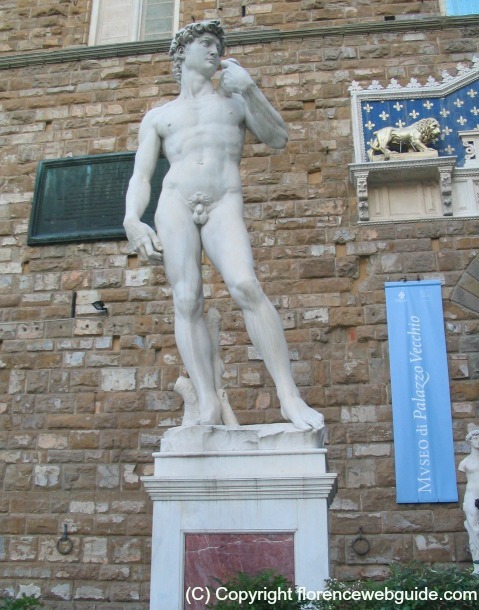 The original David can be seen at the Accademia Gallery. The pictures of Florence below show traditional festivals and celebrations. 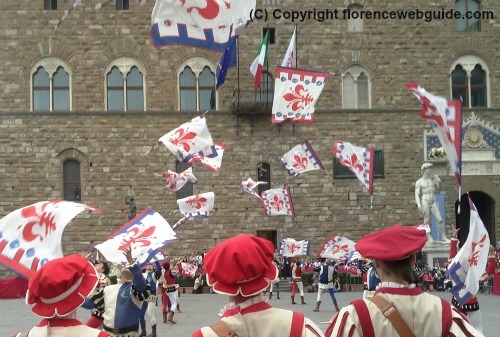 The first pic is a flag throwing competition in Piazza Signoria, with the Sbandieratori degli Uffizi, the Florentine flag-handlers. Pic no. 2 shows a procession of the Florentine Republic. And picture no. 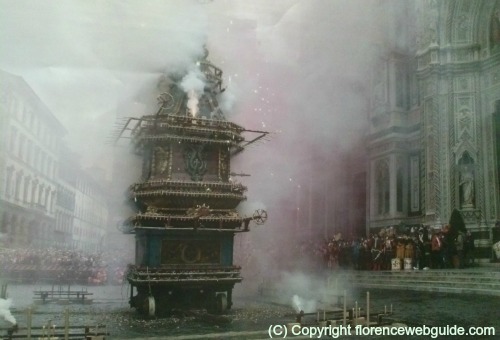 3 is the ever-popular event on Easter morning, the Scoppio del Carro, the 'Explosion of the Cart'. 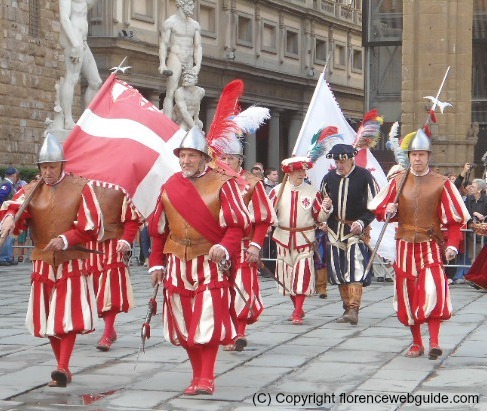 If you are interested in historical representations check out the Events by Month calendar to find out what local festivities will be on when you are in Firenze! 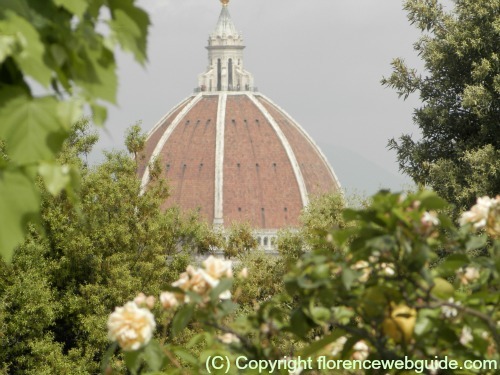 The pictures of Florence that follow are dedicated to views of and from the city's many parks and gardens. Often, from these vantage points, the eye can't help but be drawn to the imposing presence of the Duomo and Brunelleschi cupola ....as these shots illustrate. Below, the tippy-top of the cupola behind the bushes. 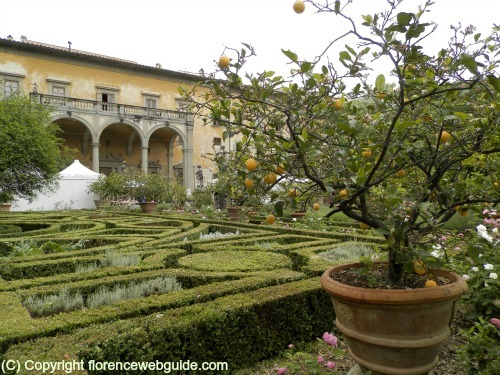 The Corsini villa and garden below are host to Artigianato & Palazzo, a craft fair held annually where master artisans demonstrate their craft and share their secrets. 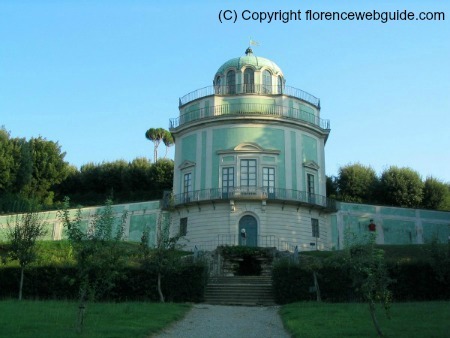 The coffee house in the Boboli Gardens is not currently open as a café but as an exhibit hall for temporary art shows. I grew up in New York, so I've gone from a NY skyline to a Florentine one! This shot was taken on the road between Piazzale Michelangelo and the Rose Garden. 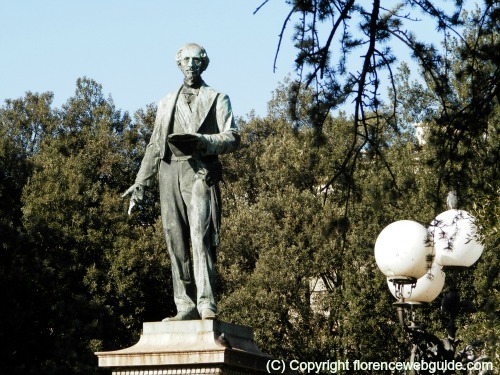 Statue of Bettino Ricasoli, statesman, in Piazza Indipendenza. 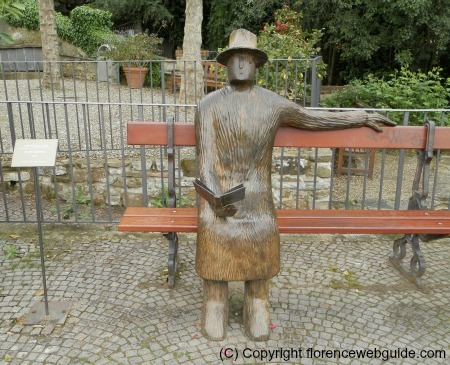 Sculpture of man seated on a bench by Folon at the rose garden. The Folon sculptures are part of the permanent exhibit open all year round. 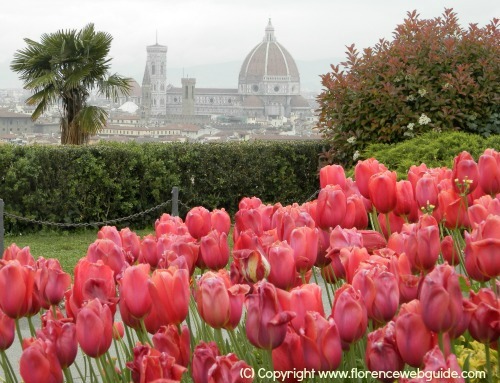 'Florence' comes from 'Florentia' in latin, meaning 'flourishing' and 'floral'....yes indeed, the city in Spring! Some more pictures of Florence with different views of the Statue of David in front of Palazzo Vecchio. 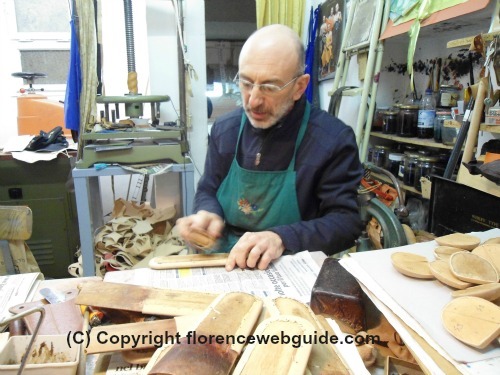 Below, the artisan life is still very much alive in Florence. 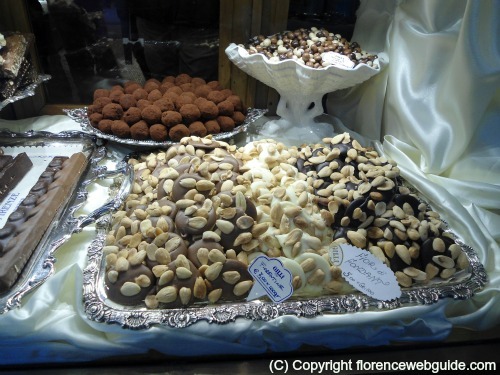 Don't come to Firenze if you're on a diet! This pic was taken at the café and pastry shop 'Gilli'. 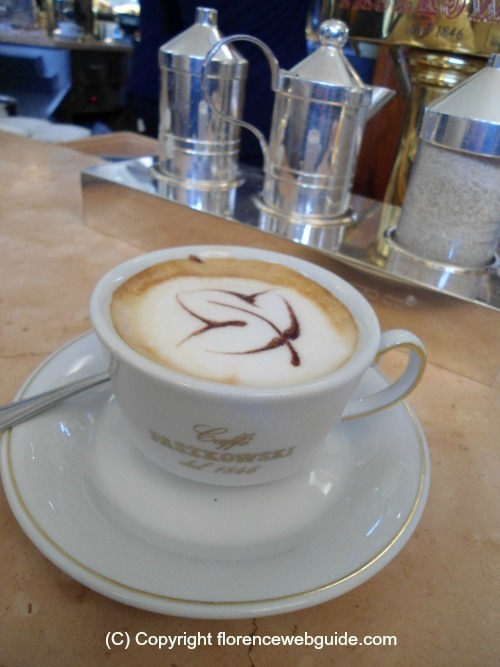 Gilli's main competitor, a cappuccino from Paszkowski coffee shop on the opposite corner in Piazza della Repubblica in Florence. 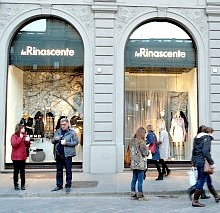 Florence is an important fashion city. 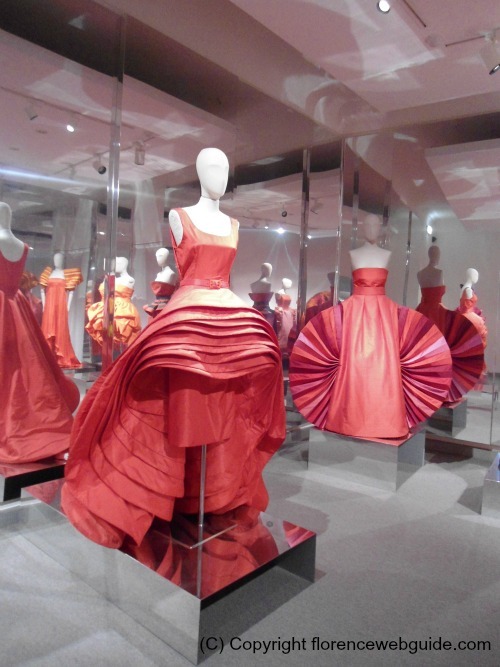 This shot is part of the Bardini museum collection. My favourite shot of Brunelleschi's cupola, peeking out from the Palazzo Vecchio battlements. 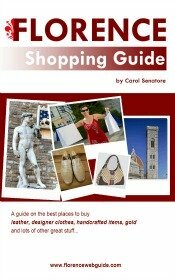 I hope you have enjoyed your virtual tour with these pictures of Florence. If so, please like this page below and share with others!